The Miru-iro, is a deep yellow-green tinged tea body that represents the color of the view mill of seaweed. Name of “Miru” is seen from the time of Manyo, but to established as clothes color name from the peace after. The color of Kasane “Outer Moegi, lining Hanada” seaweed that grows in the sea of ​​rocks arranged, to express the color of the mill. Kind of get to shallow water of the rock, “green algae” is the Miru. The color is dark green. The branches spread in a fan shape and bifurcated, it will grow to about height 40cm. 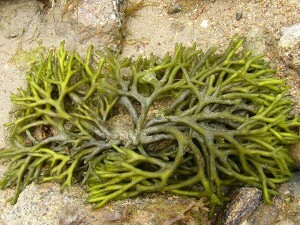 I can not eat too much in modern Japan, but had been popular as a seaweed common edible in ancient times. Also in the order “Manyoshu” I have been poems many as kakekotoba of “see”. Mill to other became color name, is also used as a traditional pattern from it interesting shape and equipped with some branch has been referred to as the “mill pattern see pattern”. “Miru-iro” is the color of the olive system is very familiar in our country was not much, Kamakura samurai and cool the color tone was the fact chest a spartan in subtle and profound, has been deeply lovers to culture’s Muromachi era. Also strong is “Mirucha” and blueness of the fashionable color was strongly tea only in the Edo era “Miruai”, you will be born further strange phase color, such as “Aimirucha” are numerous.